Today I have a secret recipe for an authentic Chinese dish served at P.F. Chang’s China Bistro. Kung Pao chicken is sweet, spicy and well balanced in flavor. 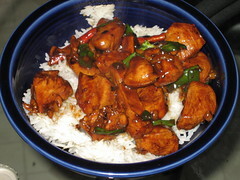 Pieces of chicken breasts are stir fried in a wonderful sauce with peanuts mixed in. Serve over steamed white rice. Spice Up Your Diet with Chinese Vegetarian Cooking. Combine chicken and cornstarch in a small bowl and toss to coat. Heat sesame oil in wok over medium heat, add chicken and stir fry 5-7 minutes or until no longer pink inside. Remove chicken from wok. Combine vinegar, soy sauce and sugar in a small bowl. Mix well and add the sauce to the wok. Return chicken to the wok and coat with sauce. Stir in roasted peanuts. Heat thoroughly. Top with additional green onions if desired and serve over white rice. Today I have a secret recipe for a spicy dish served at P.F. Chang’s. A fiery pepper sauce is wok-tossed with crispy strips of marinated flank steak, julienne carrots and celery. You can adjust the heat of this dish by using more or less red pepper flakes. To complete your meal serve this dish with some white or brown rice. brown sugar, garlic, ginger, and ½ teaspoon red pepper flakes. Mix well and set aside. Julienne carrots and celery. Slice the green onions. Place the beef strips into a medium bowl. Add the cornstarch and toss to coat. Make sure each piece is thoroughly coated. Set aside for 10 minutes. Heat ¼ cup of peanut oil in a wok or large skillet over medium-high heat. Drain the oil from the wok. In the same pan used to cook the beef, add sesame oil over medium-high heat. Add celery and give it a good stir, then add ½ teaspoon crushed red pepper flakes and stir again, and then add carrots and stir. With today’s secret recipe, you can make one of P.F. Chang’s most popular recipes at home. 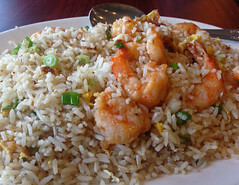 This dish is ful of peas, carrots, shrimp and rice that’s seasoned to perfection. This dish comes together pretty quickly which makes it a great weeknight meal. Today I have a secret recipe for a quick and easy Chinese noodle dish served at P.F. Chang’s. P.F. Chang’s garlic noodles are the base of some of their more popular dishes like Dan Dan noodles and are a really popular side dish that offers a milder flavor. Cook the noodles a minute shy of the directions on the bag, drain and keep on a plate while you make the sauce. In a large skillet heat the canola oil on medium high and cook the garlic until fragrant but not browning, about 20-30 seconds. Add in the sugar and vinegar and stir to combine. Toss the noodles in the pan with the canola oil mixture and and remove again while you make the sauce. You’re going to make the stir fry sauce before adding the noodles back in. Add in the chicken broth, chile flakes, sugar, shaohsing wine, oyster sauce, salt, cornstarch and sesame oil. Turn the heat on the pan up to high heat. Stir to combine the sauce ingredients and let it thicken in the pan for 20-30 seconds. Add in the noodles and stir fry the noodles until the sauce is completely absorbed. To julienne the cucumbers cut them (unpeeled into 1/4 inch slices on an angle, then slice them into matchsticks about a 1/4 inch thick.